Not to be confused with Hatfield Peverel railway station or Hadfield railway station. * Annual estimated passenger usage based on sales of tickets in stated financial year(s) which end or originate at Hatfield from Office of Rail and Road statistics. Methodology may vary year on year. Hatfield railway station serves the town of Hatfield in Hertfordshire, England. The station is managed by Great Northern. It is 17 miles 54 chains (28.4 km) measured from London King's Cross on the East Coast Main Line. Hatfield was formerly the junction of two branch lines, both of which have now closed. The Hatfield and St Albans Railway closed to passenger traffic in 1951 as part of postwar economies brought in by the British Transport Commission. The route of the line is now a public footpath, the Alban Way. Another railway ran to Dunstable North, and closed in 1965 under the Beeching Axe. The closure of the Dunstable North line has left Dunstable as one of the largest towns in England without a direct rail connection. Hatfield has waiting rooms on all platforms, with extra shelters provided at various points along the platforms, as well as a canopy on Platform 1. There is a small café-shop style business, "Chuggs" on Platform 1, and three new retail units which opened in the new station building. There are three platform faces in total - platform 1 is a side platform facing the Up Slow line & used by London-bound trains (there is no platform on the Up Fast line), whilst platforms 2 & 3 face the Down Fast and Down Slow lies respectively; the latter is used by the majority of northbound trains. The station has a "Fast-Ticket" machine, as well as a standard touchscreen machine on either side of the building. Hatfield also has many vending machines throughout the station and a photo booth inside the booking hall, which also contains toilets for both genders and a separate disabled toilet. Ticket barriers are in operation. During the daytime there is generally a half-hourly fast service to London King's Cross southbound and also every 15 minutes a stopping service to Moorgate Monday to Fridays and half-hourly on weekends. Northbound there is a half-hourly service to Cambridge, with alternate trains extended to Cambridge North. There is also a stopping service to Welwyn Garden City on the same pattern as that to Moorgate (every 15 minutes weekdays, half-hourly weekends). The station is also served by various buses operated by Arriva, Centrebus and Uno (bus company). 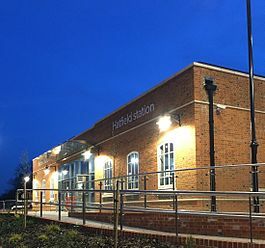 Hatfield Station was recently redeveloped to include a new bus interchange and taxi rank, multi-storey car park, refurbished ticket office, three new retail units and step-free access to all platforms. Work on the project, which is to cost £9 million, began in 2013 and was completed by the end of 2015. December 1870 accident, when a disintegrated wheel resulted in the deaths of six passengers and two bystanders. Two accidents occurred on 26 January 1939. In the first, an empty fish train was involved in a rear-end collision with a passenger train. The second involved a passenger train which ran into the rear of another. Two people were killed and seven were injured. October 2000 accident, when a GNER InterCity 225 train de-railed, killing four people and injuring 70. Hatfield railway station viewed from the public footbridge. A Grand Central train speeds through Hatfield en route from Sunderland. Wikimedia Commons has media related to Hatfield railway station. ^ Padgett, David (October 2016) . Brailsford, Martyn, ed. Railway Track Diagrams 2: Eastern (4th ed.). Frome: Trackmaps. map 15A. ISBN 978-0-9549866-8-1. ^ Cockman, F.G. (1983). The Railways of Hertfordshire. Stevenage, UK: Hertfordshire Publications. p. 24. ^ "Better stations - Hatfield". First Capital Connect. Archived from the original on 1 April 2014. Retrieved 15 August 2013. ^ Logan, Ross (10 October 2012). "£9m Hatfield rail station refurbishment approved". Welwyn Hatfield Times. Retrieved 15 August 2013. ^ "New multi-storey car park opens". Great Northern. ^ Trevena, Arthur (1980). Trains in Trouble. Vol. 1. Redruth: Atlantic Books. p. 41. ISBN 0-906899-01-X. This page was last edited on 1 February 2019, at 13:00 (UTC).